Hot off the press, our new, 58-page eBook is a comprehensive guide to improving your B2B email marketing practices. We put this book together to help our clients and friends improve the results of email marketing to other businesses. Over the course of the last six months, we’ve collected and analyzed hundreds of examples of B2B email marketing. We used these examples and our own professional experiences to compile a comprehensive list of best practices, strategies, and tips we think can help other B2B marketers. 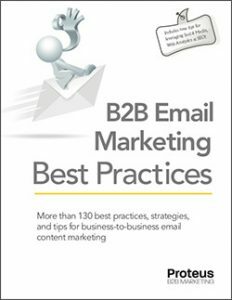 In the eBook, we also included general email marketing best practices. Early in the eBook we cover more universal issues of email content and design (although there are some specific B2B issues in there, too.) While we could have just included those practices that relate to B2B email, doing so would have ignored many other factors important in the success of email marketing. As you progress through the eBook, you’ll find more and more related to issues specific to B2B email marketing. Our hope is that by combining general best practices with those unique to B2B marketing, we’ve created a helpful guide to those starting to use B2B email marketing. If you’ve been doing B2B email marketing for some time, our hope is that you’ll find several new things to consider. We know we haven’t thought of everything, and that there are lots of good ideas still out there. We’d like to make this eBook a strong resource for B2B email marketers. If you have found other ideas and practices that work really well, please let us know via the comments on this post. We hope you like it. Let us know what you think. Thank For post,Congratulations and keep up the good work………..